One way to determine if you need a new garage door is to check the seal at the bottom of your door. If you see a gap, then perhaps you need to think about replacing your door. Or perhaps not. The seal, often called a rubber bottom, can be replaced. If the lower section is showing rot, then it may be possible to replace just that section. To find out if your garage door needs replacing or just a little TLC, call the number above. We’ll help you explore the alternatives that are best for you. When your garage door is having problems and it is not working properly, what should you do? If you are not the do-it-yourself type of person you probably will start looking for a repair company. You can find them in the yellow pages, on the internet or perhaps by asking your neighbors for a referral. Or perhaps you consider yourself to be mechanically adept and want to do the repair yourself. After all, garage doors do not look too complicated. It can’t take a rocket scientist to repair one. If you decide you can do this job yourself, make sure that you are following all safety measures. At the end of the day, you sure don’t want to end up in the emergency room just because you decided to repair your garage door. The very first thing you should do is ensure that all electrical power to your door is unplugged or circuit breakers are turned off. This will get rid any possible danger of being electrocuted. Next, check the metal tracks to see if there are any dents in them. If there are any, use a hammer or rubber mallet to smooth and remove them. Another step in your garage door repair is to check if there are any loose bolts or screws that are causing the door to malfunction. Make sure that the tracks are clean as well as in alignment. If there are any broken parts, you can call the manufacturer and get them replaced. While you are looking into different problems related to your garage door, make sure you find out what types of springs the door needs. If your door uses standard extension springs they can easily be replaced. If your door uses torsion springs you will need a trained technician to replace them. This is because these springs operate under high torsion and one mistake could lead to an injury. 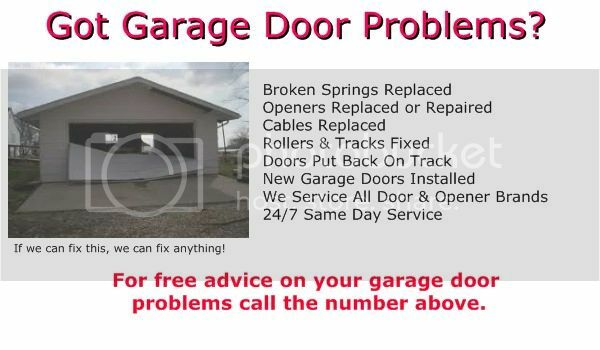 It is always a good idea to get garage door service provider’s help in this case. If for any reason you find that your garage door has stopped working, the best thing to do is to remain cool. You probably will not need a new door and most garage door repairs are relatively inexpensive, even if you have to call a service technician.